Our sky chart shows the waning gibbous moon and the Pleiades star cluster for around mid-evening at North American mid-northern latitudes. However, no matter where you live worldwide, tonight’s moon will shine near the Pleiades cluster, so let the moon guide your eye to this cluster of stars tonight. At mid-northern latitudes in Europe or Asia, the gap between the moon and Pleaides will be greater than in North America, and the Pleiades will reside more to the lower left of the moon this evening. 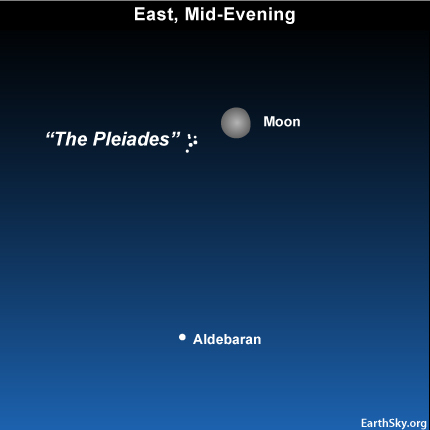 As seen from the southern hemisphere, the Pleaides star cluster will sit either more directly below the moon or to the moon’s lower right, and they’ll rise later after dark. After they rise, however, the Pleiades will chase the moon westward across the sky for the rest of the night. Tonight’s lunar glare might make it difficult to see the Pleiades. 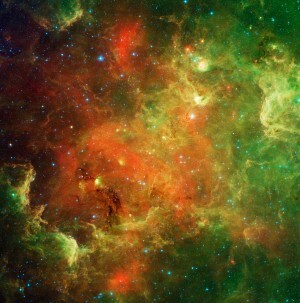 If you have binoculars, use them to view this gorgeous cluster. Its brightest stars form a unique dipper-shape pattern that makes the Pleiades – or Seven Sisters – instantly recognizable to the unaided eye or in binoculars. Once you see this starlit dipper of stars, you will see why this cluster is one of the most beloved sights in all the heavens. The Pleaides cluster returns to the same place in the sky about 4 minutes earlier every night, but the moon rises an average 50 minutes later each evening. Several days from now, check out the beautiful Pleiades cluster in a moon-free sky!